On Oct. 2, 2015, the ozone hole expanded to its peak of 28.2 million square kilometers (10.9 million square miles), an area larger than the continent of North America. Throughout October, the hole remained large and set many area daily records. Unusually cold temperature and weak dynamics in the Antarctic stratosphere this year resulted in this larger ozone hole. In comparison, last year the ozone hole peaked at 24.1 million square kilometers (9.3 million square miles) on Sept. 11, 2014. Compared to the 1991-2014 period, the 2015 ozone hole average area was the fourth largest. You can read the full press release at NASA. A couple of days ago we ran a piece at WUWT: Did We Really Save the Ozone Layer? In light of this press release, the question is worth pondering again. 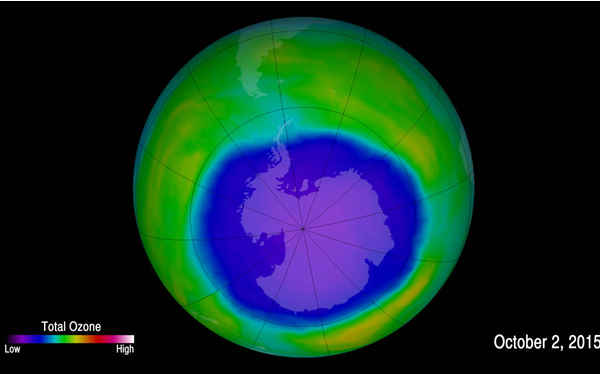 The ozone hole is where the magnetospheric foot print touches down on the earth…. Changes in the local plasma sphere causes the footprint to grow wider. This makes the ozone hole bigger. But most importantly it lets more cold air from space down onto the surface of the earth… That shows up as the a colder polar vortex that moves to lower latitudes… Activity at the poles can be tied to density fluctuations in the solar wind. markstoval confuses the troposphere with the stratosphere. It's the latter that was colder, consistent with greenhouse warming. Could they not make up their minds? I was told global warming was a dead certainty. I was told it would warm at the poles first. Now it is way colder than “normal” at the South Pole? The alarmists and logic are total strangers. I think that when it comes to discussing the ozone hole and ozone shows the true scientific ignorance of deniers in the clearest terms. Those two comments by Brant Ra and markstoval are so Dunning Kruger. I especially like the "The alarmists and logic are total strangers.". Still, the idea that cold air comes thundering down from space through the ozone hole is an interesting one. I might have to rethink my atmospheric physics. "A couple of days ago we ran a piece at WUWT: Did We Really Save the Ozone Layer? In light of this press release, the question is worth pondering again." Just two days and Anthony's Ministry of Truth is changing its 'facts'? The WUWT commenters bring to mind "Lost in the Ozone" from Commander Cody and the Lost Planet Airmen.